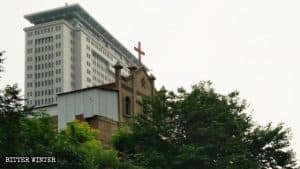 According to documents issued by some municipalities in the province of Shanxi, the clergy are submitted to annual inspections, and their movements are restricted. 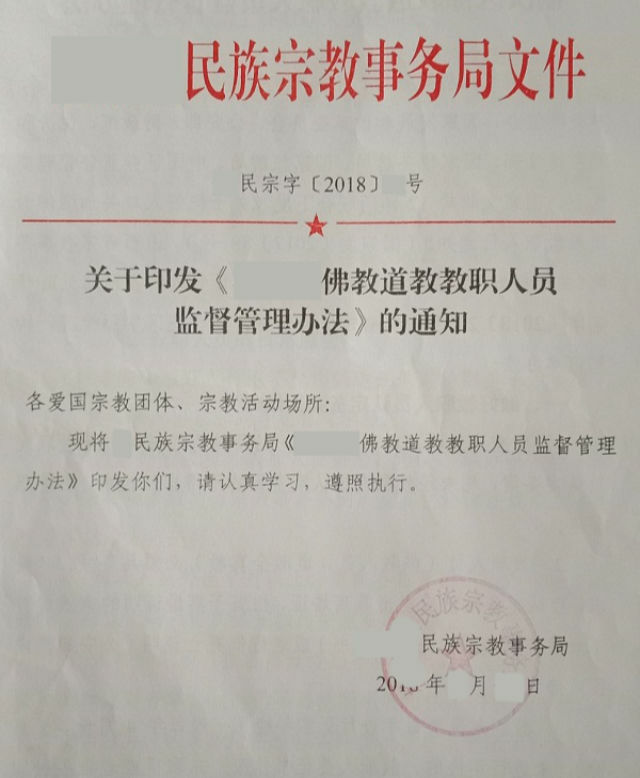 As per the document, entitled, Measures on the Management and Supervision of Buddhist and Taoist Clergy, issued by one of the municipal governments in the northern province of Shanxi earlier this year, the employment records of all clergy have to be provided to the authorities, and they are submitted to annual inspections. 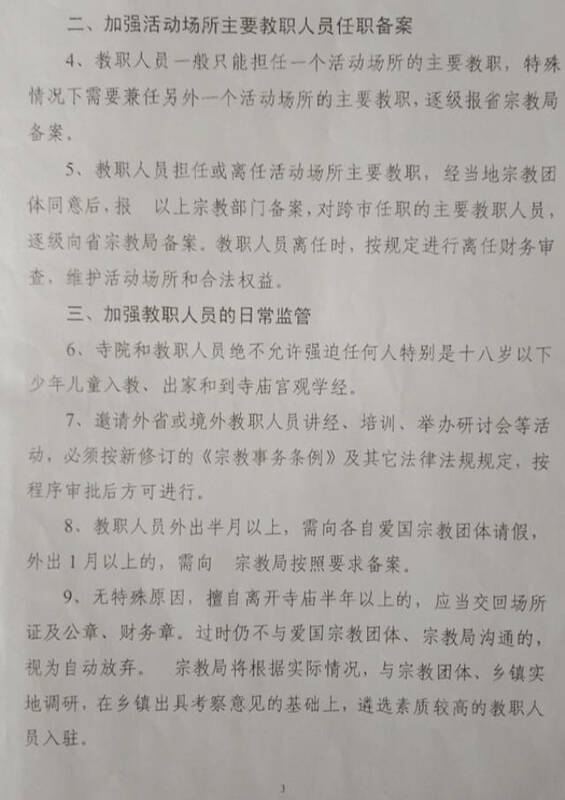 Measures on the Management and Supervision of Buddhist and Taoist Clergy. 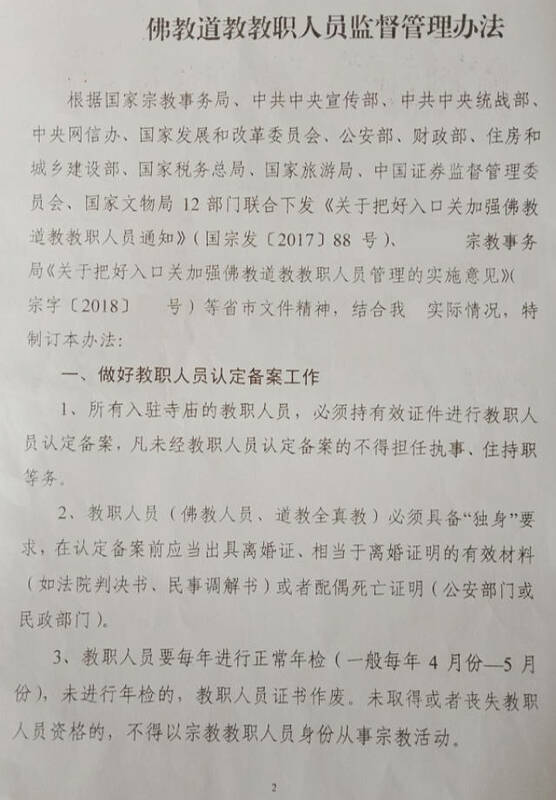 The document also demands the increase in the daily supervision of the clergy in the government-approved Buddhist and Taoist temples, including granting of permissions for traveling. 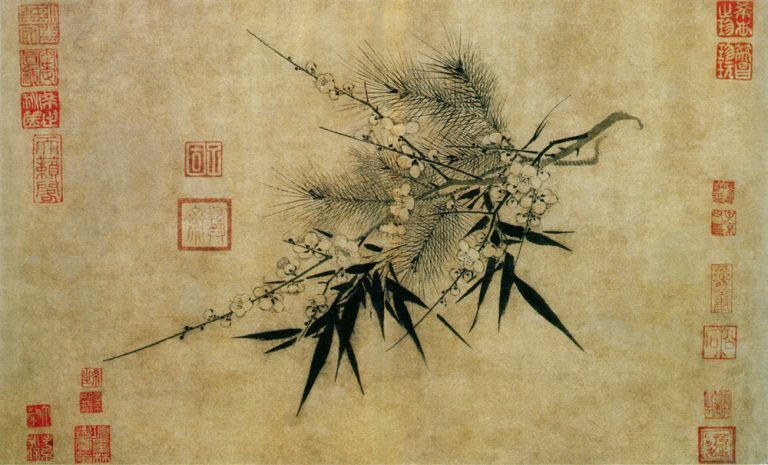 If a member of the clergy wants to leave for longer than a fortnight, permission should be given by the government-approved Buddhist of Taoist associations, accordingly. If anyone is found to be away for more than six months without permission, their clergy qualifications will be revoked. Whenever an outsider visits a temple to engage in spiritual practice or work as a volunteer, he or she must be registered at the local public security agency and report to the Religious Affairs Bureau. 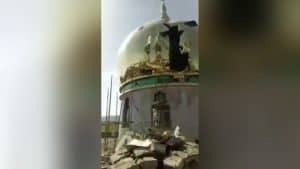 The provisions in the document forbid to serve a primary clergy role in more than one temple without filing a record with the provincial Religious Affairs Bureau. Meanwhile, the CCP is also tightening its noose around the Buddhist and Taoist clergy who don’t have government certification. 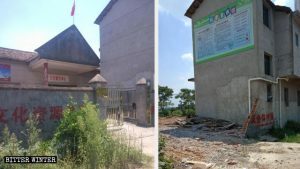 Towards the end of August, in the eastern central province of Jiangsu, a well-known Buddhist in the Lianyungang city area was arrested and secretly taken to a small room for interrogation. Angered by the aggressiveness of officers during her questioning, she swallowed the cap of a mineral water bottle. Soon, she could not breathe and was foaming at the mouth. She was taken to a hospital and released from police detention the next day. 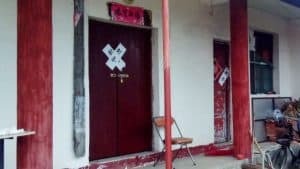 Before this, in April, the 80-year-old Zhao Rufen’s home in northern Xinjiang’s Shihezi city was raided upon. Ms. Zhao is also a well-known Buddhist in her area who has set up a temple in the past and has many disciples. 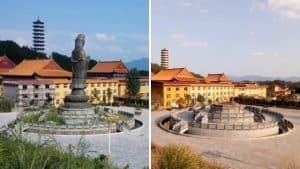 The police ended up confiscating Buddhist texts, statues of Buddha, and other items valued at over 170,000 RMB (or 24,000 USD approximately) from her home. Later, homes of 18 of her disciples were raided as well. 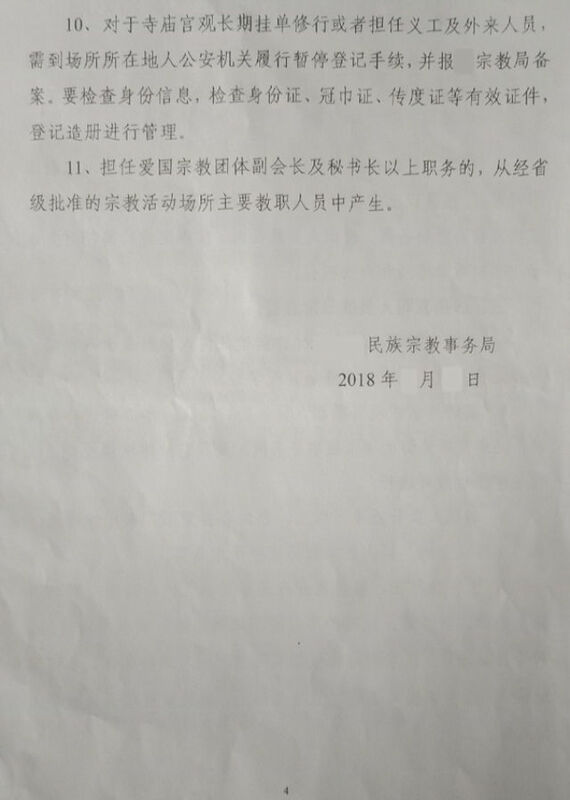 Notice on the printing of Measures on the Management and Supervision of Buddhist and Taoist Clergy.